When I think of open source, I think of FIRST. FIRST (For Inspiration and Recognition of Science and Technology) is training the next generation of open source contributors through a program called FRC, or FIRST Robotics Competition. FRC challenges teams to build a robot in six weeks that can compete in a competition. This year the challenge is called Recycle Rush. The goal is to stack plastic totes and recycling bins on scoring platforms to score points. The team with the higher score wins. But, FIRST is about more than winning. It's also about more than robots. It's really about friendly competition and learning technical skills. As you may have guessed, I'm on a FRC team. I'm a proud member of Team 2399, The Fighting Unicorns. We're an all-girls team, of around twenty, and we use a lot of open source. The code for our robot is available under an MIT license and on GitHub. FRC programmers act like a community within our groups, but also outside of our groups. We regularly browse FIRST forums to fix code bugs remotely for other teams. And, some members of my team have even driven an hour to help another team with their robot. My team believes in open source culture; there have been many times we have needed help, and we actively help others. At FRC competitions, open source culture is abundant too. Programmers tend to find other programmers to talk to about their latest projects, and I can recall countless announcements over the intercom that "team X needs a programmer." It's kind of like the bat signal, but for programmers. Whenever the call for programmers is announced during a competition, there's a scrambling of programmers from the many teams there that rush to the pit administrator to help out. Once the location has been determined, the small herd of programmers makes a mad dash over to the team that needs help. When we get there, we figure out who knows the language that the team is programming in and how can help; while those who can't help go back to their team's pit. Once, a team I had been helping throughout the day lost communications with their robot for unknown reasons. They couldn't contact the roboRIO, or "brain" of their robot, which meant that they couldn't control it. They couldn't get contact from their laptop, and the pit administrator couldn't get contact either, even when he reset the roboRIO and enabled it in safe mode. I noticed a large gathering of people in that team's pit. I went in and got some background on what had been happening. I tried to ping the roboRIO, but got no response. Then, I left the pit to grab my Linux laptop. I returned with my pink tool belt and Linux skills blazing. I opened my terminal, plugged in the ethernet to the roboRIO, and tried to ping it again. This time it worked! We had reestablished communications. And though no one ever really knew why, no one cared at that point because now they had a functional robot. At the time, we were just glad to have saved the roboRIO. Looking back, I see this as an example of how people come together in the spirit of robots and find themselves using open source tools. 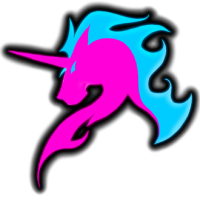 Soon, my team (Team 2399 The Fighting Unicorns) will be going to the FIRST World Championship in St. Louis from April 22-24. 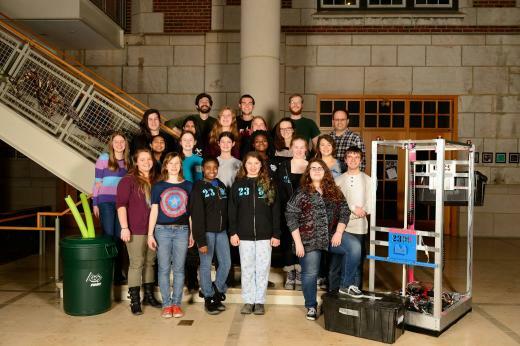 At the competition, we will be using our robot, Helena of Troy, and lots of open source programming and tools along the way. There, teams will share their scouting databases, code, and how-to guides for rookie and veteran teams. If you'd like to see our progress at competition, follow us on Twitter @HBRobotics2399.